It’s been a little over a month and a half since my coworker Jason came into work and shot himself. I’m still really mad at him, and I still have random flashbacks to those intense moments. I know I will never forget that day, and I don’t know if I will ever be able to forgive Jason, or even think kindly of him, but what I can do is remember one of the things we did bond over and that is scones. Jason was a great scone baker and I loved talking to him about the delicious scones he brought in from time to time. The recipe is below. Make a ball out of your dough and place it onto a lightly floured surface. Press dough down in a rough circle about 1/2″ high. Cut into triangular pieces and place them onto your parchment paper covered cookie sheet. Brush with melted butter. Bake at 425º for 10-12 minutes. 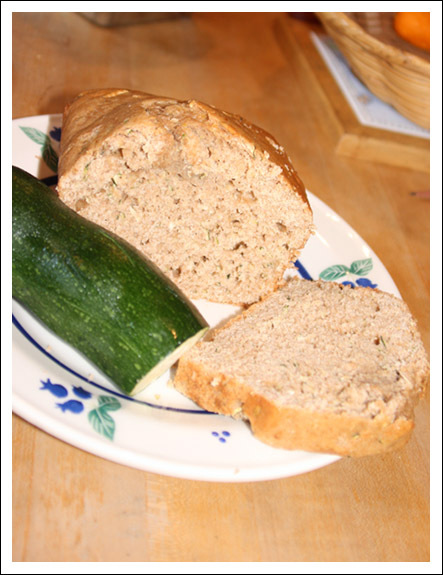 Most zucchini bread recipes are heavy on the sugar and oil, and taste a lot more like zucchini cake than bread. This recipe comes from the King Arthur Flour Whole Grain Baking cookbook and is much more like a traditional bread recipe. The flavor is complex and delicious and the consistency is dense and bready. Perfect for eating plain or spreading with your favorite butter, jam, or cream cheese. Preheat oven to 350ºF. Lightly grease a 9″x5″ loaf pan. In a medium bowl mix together dry ingredients: flours, sugar, baking soda, salt, and nutmeg. In a larger bowl or mixing bowl whisk the eggs milk and oil together. Stir in the dry ingredients until uniformly mixed then add the zucchini, walnuts, and lemon zest. Bake for one hour, check the center with a toothpick, if it comes out clean your bread is done, if not bake for a few more minutes and re-test. Let bread cool in pan for 15 minutes then run a knife around the edges and remove from pan to cool on a wire rack.